MIRAMAR - Thirty years ago, FBI agents Ben Grogan and Jerry Dove died in a vicious gun battle with two heavily armed suspected bank robbers in Miami-Dade's Suniland area, which is now part of Pinecrest. It's described as the bloodiest shootout in FBI history. FBI Director James Comey is scheduled Monday to speak at a ceremony at the FBI's office in Miramar. There will also be a wreath-laying event in Pinecrest, where the April 11, 1986, gun battle occurred, reports CBS Miami. Grogan was 53 when he died. He was a two-decade veteran nicknamed 'The Doctor' and was one year shy of retirement. Dove was 30 and had joined the agency four years earlier. The so-called "Miami Shootout" also left five other agents wounded in the April 11, 1986, gun battle with two serial bank robbers at SW 82nd Avenue and 122nd Street. 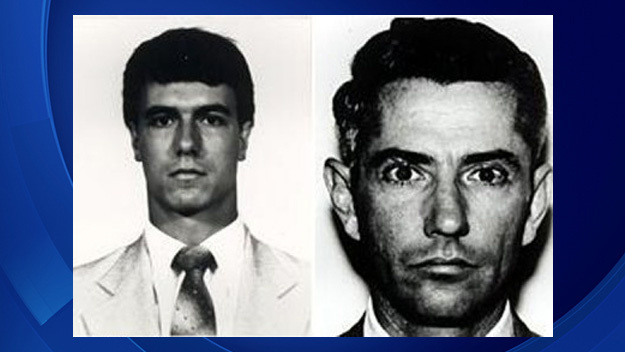 The suspects, William Matix and Michael Platt were also killed by one of the wounded FBI agents. More than 140 shots were fired. It all started when agents Dove and Grogan spotted the suspects' vehicle. A high speed chase ensued when the agents tried to stop the vehicle. When agents in three FBI vehicles finally managed to stop the suspects' car, Matix and Platt came out firing. The incident is infamous in FBI history and is well-studied in law enforcement circles. Despite outnumbering the suspects 4 to 1, the agents found themselves pinned down by heavy rifle fire and unable to respond effectively due to their much smaller service handguns. The suspects had a Ruger assault rifle, a shotgun and .357 caliber handguns. Although both Matix and Platt were hit multiple times during the firefight, Platt fought on and continued to injure and kill agents. This incident led to the introduction of more powerful handguns in many police departments around the country including more powerful semiautomatic weapons for all FBI agents. In 2001, the Village of Pinecrest honored the two agents by co-designating a portion of Southwest 82nd Avenue as Agent Benjamin Grogan Avenue and Agent Jerry Dove Avenue. Street signs and a historical marker commemorate the naming of the roadway in honor of the two agents.